Summary: The penultimate episode of season 2 asks both heroes and villains what they’re fighting for, and answers with a thrilling, high-stakes hour. Oliver and Laurel survive the tunnel collapse that takes out the incoming Mirakuru soldiers. 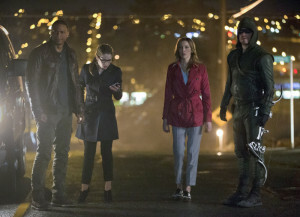 Laurel uses Oliver’s bow and explosive arrow to escape and return to Felicity and Diggle, who have just run over Isabel with the van. They return to see the city already torn to shreds, but set their sights on getting the Mirakuru cure from the S.T.A.R. Labs courier. 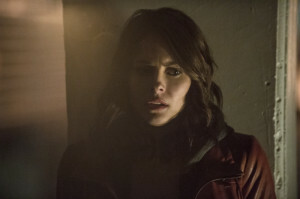 Laurel splits from them and runs into Sara, who has returned to Starling uncertain about her future. Laurel reveals she knows Sara’s identity, and gives her a pep talk, convincing her that she’s not as irredeemable as she thinks. As a result, Sara saves someone from a burning building, and Laurel names her as the Canary to onlookers. She joins up with Quentin, who managed to take out a Mirakuru soldier on his own thanks to three handy grenades. With the police chief dead, Quentin convinces the rest of the policeman to join forces with Arrow; they reluctantly agree, and Quentin is promoted back to detective. Oliver, Felicity, and Diggle try to track down the courier to retrieve the cure, but a Mirakuru solider gets to him first and steals the cure. Sebastian is horrified by the chaos Slade has unleashed, and realizes that his goal has never been about saving Starling, but getting revenge on Oliver Queen. He gives the cure to Oliver to stop the madness, but is murdered by Isabel for his subterfuge. Oliver is hesitant to try the cure on Roy, who has now been moved to the Clock Tower. However, A.R.G.U.S. sends their military operation to block off the city and destroy it completely to stop the Mirakuru soldiers from getting out of Starling; Oliver convinces Waller to give him until sunrise to come up with his own solution. This ultimatum gives Oliver the drive to inject Roy with the cure. Meanwhile, Malcolm returns to save Thea from a Mirakuru solider, and tries to convince her to go with him. In the middle of his plea, however, she gets her hand on a gun and appears to shoot him. “Streets of Fire” is about that age old superhero adage: Fight for what you believe in. It’s blatantly obvious, as Sebastian spells out the whole “what I’m fighting for” bit verbatim, and in fact numerous discussions are about as heavy-handed as this show has ever gotten. But enough careful build-up has come behind this last string of episodes that, even though it’s mostly a collection of sh*t hitting the fan in every possible way, there are endpoints for character arcs underlining them. Sara, Laurel, and Thea all make choices that they wouldn’t have made a year ago. Oliver, Felicity, and Diggle are veterans of this kind of crisis, and react appropriately. It goes a long way to make all the hamfisted talk about heroes and fighting the good fight not just excusable, but believable and imperative. This shows itself in this episode especially, where we see these complex, realistic human characters struggling to adapt to an increasingly more fantastic comic book world. For Oliver and Sara, both need to hear all that talk of saving the city, fighting to honor the dead, and being a hero. Those are simplistic black-and-white concepts, but believing them is the only way to keep hope against impossible odds. Both of them have struggled heavily with the morally grays this season, but Slade’s endgame is about as simple-minded and black-and-white as they come—get revenge on Oliver by doing evil–and as such, their ultimate goal needs to be simple. There are lots of gears turning, and the stakes only get higher with the inclusion of A.R.G.U.S., the cure, and Malcolm Merlyn, but “defeat the bad guy” is still what needs to be at the forefront. Doing exactly the opposite of Slade, which is basically just doing good in general, is how to do it. It would be corny had the show not already been building up to this since the start. This is most clearly presented by way of Sebastian Blood’s final arc, which sees him realizing how impossibly simple-—and by proxy, insane—Slade’s motivations truly are. While much of “Streets of Fire” has Team Arrow regain its forces and get back on its feet, Slade’s little team is quickly unraveling. Even Isabel, who thus far remains fiercely loyal to Slade out of what can only be her own psychosis, has an uncertain reaction when she asks, “Who’s Shado?” Slade managed to pull this trifecta together out of a shared insanity, but veiling his true motivations is starting to cost him. Slade has been so ravaged by the Mirakuru that there’s nothing left but a monster squarely aimed at revenge and chaos. As complex as his plans have appeared, there is no thought about what will happen after he deems Oliver utterly destroyed. No higher justification, just a vengeful hallucination of Shado yelling at him to kill pretty much everyone and everything. A complicated Malcolm Merlyn, he is not. This is in stark contrast to Sebastian Blood, who had been teased as being the Big Bad for a good half of the season. We get a fitting farewell for Kevin Alejandro, especially given that he’s proven to be one of the most competent and consistent villains the show has put out. Blood flirts with the good side in his final outing, but it’s not out of character for him. That’s mostly thanks to the history of Alejandro’s performance, as he’s adeptly played Blood as sympathetic, a good person buried underneath the sociopath, had things in his life played out differently. His final scene with Oliver paints a picture of a man driven to his twisted sense of morality because of childhood trauma, much like any comic book hero or villain. But that scene also makes it clear that, while Blood fully believes he’s doing the right thing because he loves the city, he’s still insane enough to think he could actually remain mayor after this. 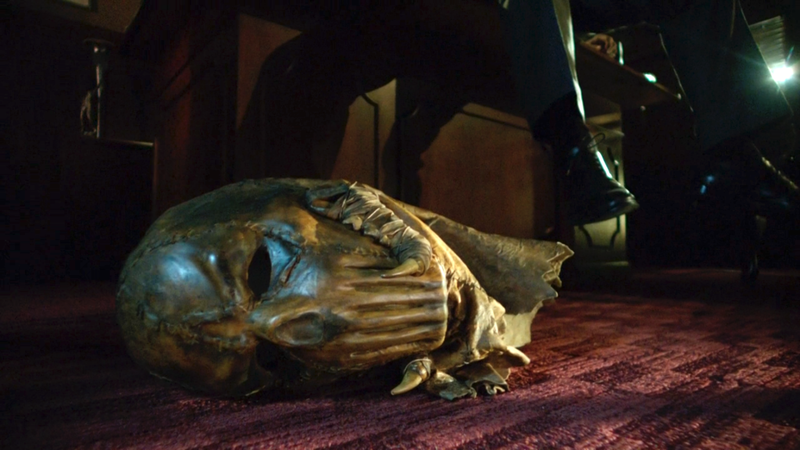 His explanation of the skull mask as a personification of his father is also solid evidence of his insanity, but that he honestly thinks turning over the Mirakuru absolves him of his crimes and he could somehow still remain in Slade’s good graces puts the nail in his coffin. An alternate universe where Blood survives through season 3 and becomes an unsettling ally for Team Arrow would have been interesting—welcome, even—but this is an hour made to clean and tie up the threads in time for the finale. Blood has a complete arc with this episode, one that complements Oliver and Sara’s rises to heroism and Slade’s descent into villainy nicely. The most divisive and surprising aspect of this season has without question been Laurel and Sara. There’s a certain “painted into a corner” feeling in a lot of ways, because losing either Laurel or Sara could easily feel like a cop-out for the Canary mythology. But the show has powered through that by making Sara an incredibly likeable character while taking major strides to make Laurel vital, to varying degrees of success. While it’s much felt like “there can only be one,” this episode suggests a version of Arrow where they could conceivably coexist as a split Black Canary, each representing different sides of the same coin. Sara is the muscle and the actual superhero, but one with baggage keeping her from fulfilling her potential. Laurel is the essential support, cheerleader and the outside perspective that keeps the heroes kicking. Her pep talk to Sara is strikingly similar to the one she gives Oliver in “City of Blood,” focusing on how she knows who these people are regardless of what’s happened to them in the past. Katie Cassidy and Caity Lotz haven’t had many opportunities to have good scenes together this season, so this is an easy pick for the best one. They do feel like sisters for the first time, and Lotz especially delivers the clunkier bits with aplomb. Laurel’s dialogue is much better than her pep talk last week, too, particularly her acknowledgement that she couldn’t possibly understand what Sara has gone through. 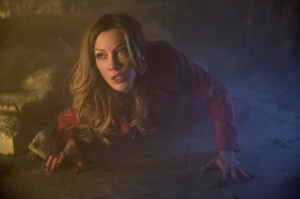 Many previous attempts to give Laurel some good moments have failed because of her ignorance of the show’s narrative, but with her in on the secret here, she can ironically see what she doesn’t know. That makes her genuine insight stick out more, since she’s making assessments based on real knowledge, rather than awkward intuition. As for Sara, I mentioned back in “Seeing Red” that Sara’s arc was a bit clunky getting to this point, but that doesn’t diminish the importance of what develops here. Again, this is very standard superhero fare, but the main point of “Streets of Fire” is seeing things as they are. Sara has certainly committed plenty of atrocities as an assassin (despite how little we’ve seen of that), but at this stage, she’s a good guy. She literally rescues someone from a burning building. It’s something pulled right out of a every comic book and superhero movie ever made, but that’s who these angst-ridden vigilantes need to be. The person being saved or the people witnessing the act don’t see the traumatic history and past misdeeds, they see a hero, plain and simple. Sara thinks she’s irredeemable, but Laurel makes it clear that proving she isn’t is exactly the reason she needs to keep fighting. Of course, the cloud looming over all this still is the volatile question of who Slade will deem as the person Oliver loves most. “Streets of Fire” definitely has fun with this mystery, throwing in all sorts of teases. The episode opens with lots of material between Oliver and Laurel—regardless of any romantic tension, the bit with Laurel and the bow is damn cool—but Oliver’s borderline-obnoxious worry about Laurel getting away safely is not something seen with any other female he’s courted. And then there’s the big almost-kiss-tease moment between Oliver and Felicity, which might have been mean-spirited if there hadn’t been such a great scene leading up to it. Felicity has her standard role of funny one-liner machine and emotional core, and certainly succeeds at both. But Emily Bett Rickards racks it up in this particular scene with Oliver, nailing the underlining distress and frustration that Rickards pulls off so well. And then of course, there’s the fact that Sara is technically Oliver’s actual girlfriend throughout all this, even with her mostly MIA. All three of the women in Oliver’s life get particularly good moments, and have their own solid reasoning for why they need to remain on the show. That means that no matter who might get the axe next week, losing any one of them would make a massive impact on the show’s direction, unless we get thrown a curve ball. Thea’s probably safe, at least, given John Barrowman’s welcome return as Malcolm. Despite those gunshots marking the the penultimate cliffhanger (placing bets that Malcolm can regenerate thanks to the League?) the Thea and Malcolm subplot doesn’t get too much screen time in all the mayhem. But what we do get bodes well for the future, as this thread will hopefully continue into the third season. Malcom is now fighting for the one piece of him he has left: Thea. Thea doesn’t really have anything or anyone to fight for anymore other than herself, and it’s this connective tissue that binds the newfound father and daughter. That said, Thea’s outright disgust at Malcolm is earned and well-played by Willa Holland. That spark is sure to keep things tense even if Thea decides to side with her father one way or another. This season has done great work slowly breaking down Thea’s life enough to get her to a place where she might believably go under Malcolm’s wing. And of course, there’s Oliver. “I have failed this city” is meant to be the big line, of course, but in addition to its legacy, it’s a summary of where Oliver is now. Lest we forget he was suicidal only hours earlier in the show’s timeline, and the fragility of his ego is on display. Even after some solid pep talks from Laurel and Felicity, hopes are so frequently dashed that Oliver has trouble keeping up the fight. Stephen Amell always does fine work, but the challenge here is keeping Oliver focused while more uncertain than he’s ever been. This is different than the shaky and unhinged Oliver from “Three Ghosts” or the episodes after “The Promise,” as the stakes require the Arrow to still bring his A-game. But there remains constant doubt behind it, more than ever before. Oliver’s lesson in “Sacrifice” was very much about learning what he fights for—his family—but “Streets of Fire” has him pondering that question again, now that Moira is dead and Thea is supposedly out of his life. He can’t bring himself to inject Roy with the cure at first because he doesn’t know why he’s doing it; if beating Slade is impossible, and he no longer has a family, then is there even a point in potentially killing Roy? The answer comes when Amanda Waller threatens to kill everyone in Starling City if the Mirakuru threat isn’t contained. 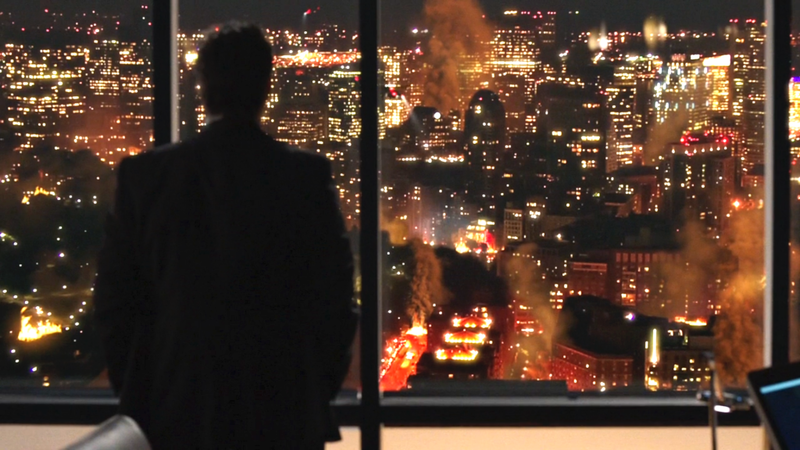 Perhaps Oliver doesn’t have a family anymore, but he does have a city to protect. Like Sara, Oliver needs to scale back a bit from the guilt and complexities of his friendship with Slade, and instead realize that he has to save the day, because he’s the good guy, and everyone will die if he doesn’t. It’s that simple. Slade’s attempts to destroy Oliver threatened the Arrow’s status as a hero in every way, and now it’s time to fight back by proving what a hero he’s become. It’s quite a feat that the Mirakuru army attack has been able to keep up the intensity spread over these episodes, with the feeling that it’s not even close to being over. The large scale of this crisis is felt even though many of the scenes tend to be small, and that’s due in part to stellar performances and quick intercutting of multiple scenes across the city’s landscape. Every character gets a heroic moment—even the police force finally sides with the Arrow, with Quentin becoming detective again!—and evokes hope in the darkest part of the narrative. Even with the city in shambles, “Streets of Fire” has the heroes getting back on their feet. 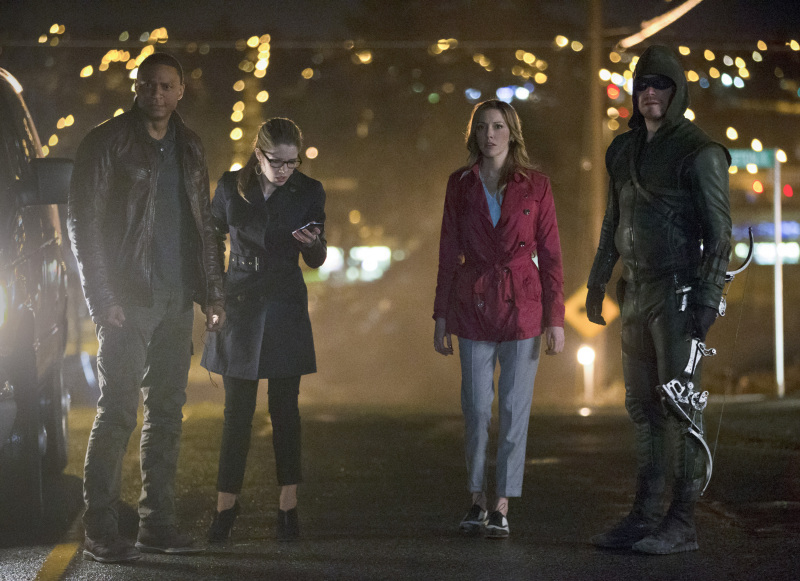 A stronger, more determined Team Arrow is on the horizon, even if the final battle won’t be an easy one. David Nykl as Anatoli Knyazev is probably the best, or at least most entertaining, part of the flashbacks now. Hopefully he sticks around for next season, because he plays against island-Oliver’s growing grimness nicely. Felicity gets lots of good one-liners as usual, but her attack on Isabel with the van and subsequent reaction (“Do I run her over again? !”) is a standout. That Isabel randomly chose Felicity as her nemesis for no real reason is hilarious. Kate Spencer’s violent death is probably supposed to evoke something, but it’s hard to feel for a recurring character that pretty much only existed to get inexplicably pushed around by Laurel. It’s hard to assess Cynthia Addai-Robinson’s performance, since her cold stiffness is clearly a conscious choice for Waller, but also makes her boring to watch much of the time. However, she’s allowed to show a bit of emotion here to drive home how perilous the situation is, and her coldness towards nuking an entire city is, ironically, very interesting. The city burning effects are very good, mostly because they’re only used when they’re needed for particularly affecting shots. Whether Slade survives the end of this season or not, it would be nice to have Manu Bennett return next year for some explanation or flashbacks to his time between his “death” on the island (which we’ll surely see next week) and appearance in Starling this season. Despite how Slade-centric the season has been, we’ve still gotten very little about his pre- or post-island life. Like, what exactly is that son of his doing now? Did anyone ever think about contacting him when his father became a fugitive in an abduction case? And where did he get all that money and power from, anyway? If they haven’t already, it’d be perfect use of that supplemental digital comic. “A bunch of them.” There were like five of them, Laurel. You could have just said there were five. Wild bit of speculation: The obvious choice for a major death is Sara, given that a sacrifice would play pretty well into her redemption arc, and Lotz is still technically a guest star. But these last few episodes have sprinted through Laurel learning the secrets, solving the mysteries, getting in on the action (even using the bow!) and playing a vital role in fully forming Sara as Canary the hero. If she dies, Sara would continue as Canary in Laurel’s honor, and hell, they could even throw in a line about “Laurel being the true Canary in spirit” or something. I hope they don’t, because it’s rides too close to Smallville’s Jimmy Olsen fiasco…but if it does, I called it. All the build-up has led to this, and it pays off handsomely. With as metered, even bordering on dull, as last episode was, this hour offers not a slow moment. Even when it takes breaths for character, it’s all momentum for the entire hour. Other than resolutions, there’s much about the episode that plays like a season finale, making this Act Two definitely feel of a larger piece than the usual set-up of a penultimate chapter. What’s really rather fascinating is the way they are able to respectably support the scope of the story they are trying to tell. Surely, no one will confuse this with the massive scale you’ll see in countless hours at the movie theater this summer. Series television is frequently limited in that regard, and the tighter budgets of the CW network often constrain that further. Yet, Arrow manages to stretch its dollars and resources to present the idea of something much larger in an effective way. They did a bang-up job with it in “Darkness on the Edge of Town” and “Sacrifice (Matt’s View) (Derek’s View)” last year, and yet this hour feels even more ramped up. Sure, you’ve got Slade contained to watching over the burning city from the Queen Consolidated CEO office, Sebastian holed up in the Mayor’s office, Lance and crew mostly stuck in the precinct, and Team Arrow hiding out in the Clocktower, but those trapped locations actually give a greater psychological sense to the chaos going on around them. When they do take to the streets, the scenes are varied enough and populated with cars and debris, if not people, to place everything in an actual city rather than feel like a backlot somewhere. Kudos to production on that. Adding to that variety is having Sara return to help Laurel at street level, and Malcolm Merlyn attempting to save Thea at the train station. These matches are designed to provide moments of character work and what they offer is stellar, in particular the touching Sara and Laurel exchanges. One couldn’t help but feel a little choked up when Sara rescues the child from the burning building (yeah, yeah, trope; so what?) and Laurel officially dubs her the Canary for public consumption. There’s also a bit of fun in father and daughter both knowing what younger daughter does with her nights yet unaware each knows, especially in the pride they both feel for her. I hesitate to say or think it, but much of this feels like set-up to redemption and sacrifice for Sara come the finale. Terrific character work abounds, even in little throwaway asides, like Isabel Rochev not knowing about Shado. (A moment of reflection on how terrific Isabel/Summer Glau looks in the Ravager outfit, mask aside.) 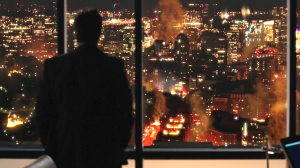 The opening sequence with Oliver instructing Laurel on how to fire the arrow to free them — there is a very definite and considered symbolism to a character on the show using a bow as a means to free and unlocks themselves, in every sense — was a watershed moment, followed by Laurel’s superbly defiant dismissal of Oliver to go help the city. And who would’ve thought they’d make such a fun, engaging side character of KGBeast, of all comic characters. Briefly, all due respect to Colton Haynes, from purely an actor’s standpoint. One of the hardest things to do, though it may not seem like it from the outside, is to play essentially scenery. Roy is by no means a prop, but he’s there to flesh out the world of the scene and support the other actors. Sebastian Blood is given appropriate conflict, as he truly does care about the city and what he can do for it. It’s quite odd that they took that little sojourn earlier in the season to have him kill his mother in the mental hospital. Felt like it was trying to make him more of a dangerous wildcard, but now it plays a bit more like demonstrating his subjective grip on reality for his moral compass. There is great tragedy to a man wearing a mask, which has obvious implications for our main hero. Goodbye, Sebastian, twisted as you were. They’ll get the “juiced-up jackboots” for you. And goodbye, Kate Spencer, Manhunter. We hardly knew ye. Growing even more fascinating are the complexities of the Oliver Queen-Amanda Waller relationship. Even a simple line like “How did you get this number?” offers much portent, and speaks to a compelling dynamic ripe to be explored in the future. ARGUS shutting off the city is very much an Amanda Waller move, and one looks forward to the repercussions of such, likely involving Diggle and certain squad. It’s especially nice to see everything distilled back down to the core Team Arrow. Extra help is always fun and adds dynamic — the finale is sure to offer a broader scope of allies — but the initial triumvirate holds more weight, potency, and poignancy. The push for romance aside, the scene between Oliver and Felicity in the Clocktower was one of true care and connection between two compatriots. If Oliver needs Felicity for anything in his life, it’s for that unshaking belief in what he does. That carries over to John Diggle for both, as well, and that quick exchange between them before Oliver and Dig got to meet Sebastian was note perfect. Always doing right by connecting the emotion of these events to the three partners. The crux of the upcoming finale is established in the final interaction between Oliver and Sebastian. The “whoever you love the most” gambit is designed to have the audience guess and/or choose between Laurel, Sara, Felicity, and possibly Thea. That’s not to say for certain that any or all of them are going to lose their lives, but it’s an intriguing proposition to hook the various segments of the viewership in for the final showdown. All in all, “Streets of Fire” is one of the best on the season, and does a fantastic job of coalescing the myriad storythreads in preparation for the “Unthinkable” next week.